AMSA BCP™ 2000 series products are chemicals used in cooling tower water treatment programs and in other industrial process cooling water applications. 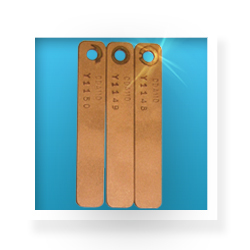 AMSA BCP™ 2000 series products are based on AMSA’s second generation chemistry. BCP™ 2175 and BCP™ 2430 are chemicals used in cooling tower water treatment programs. They clean up industrial cooling water and process systems and maintain clean surfaces in those systems! While these products deliver the main features of AMSA BCP™ chemistry, the new active on which the BCP™ 2000 products are based offer water treatment service professionals unique benefits for their industrial water treatment programs. 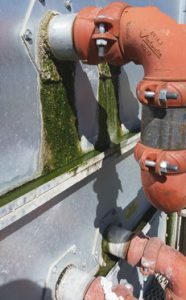 Algae growing on a water leak on the outside of a cooling tower on September 12, 2016. While all BCP™ products clean fouled systems, BCP™ 2175 is the most potent chemistry to penetrate biofilm and release it from system surfaces. BCP™ 2175 is especially effective at penetrating algae and when used in conjunction with an algaecide, the resulting algae control program is most effective. 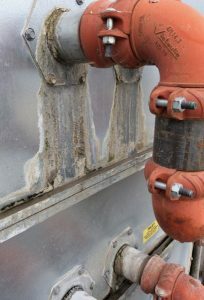 Algae growth controlled with a BCP™ 2000 and DBNPA biofilm control program circulating in the cooling tower water. Enhance your biofilm/algae/Legionella control program with BCP™ 2000 products. BCP 2430 or BCP 2175 chemicals used in conjunction with a biocide in cooling tower water treatment programs will result in better overall microbial control and satisfied customers. Check out our Injection Mold Case Study in which a chemical treatment program with BCP™ 2430 kept injection plastic bottle molds clean and free of corrosion caused by MIC.